In 1996, Reclamation created the Water Conservation Field Services Program (WCFSP). 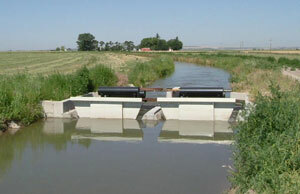 The WCFSP is designed to encourage water conservation, to assist water agencies with developing and implementing effective water management and conservation plans, to Floating water control gates maintain steady canal levels and irrigation deliveries at the Milner Irrigation District.coordinate with state and other local conservation program efforts, and generally to foster improved water management on a regional, statewide and watershed basis. The WCFSP is designed to be flexible, allowing area offices and regions to implement the program to fit local needs and to compliment and support other federal, state, tribal, and local water conservation efforts. Assistance can be provided in the form of technical advice or financial incentives. 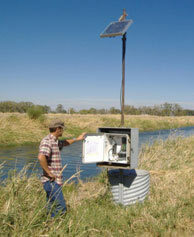 In cooperation with water users, states, federal agencies, local entities and others, the Snake River Area Office (SRAO) directs its water management and conservation efforts towards helping water users identify and implement water efficiency improvements that will improve the overall beneficial use of water and related resources. Helping to remedy current problems by providing tools (education, training, outreach) to help resolve, and prevent, similar problems in the future. Finding ways to provide water for beneficial uses which are presently not being met. Reducing negative impacts resulting from inefficient water operations. Improving, enhancing, or enlarging current benefits for present beneficiaries.